Here are some interesting facts about Frida Kahlo. Frida Kahlo was a Mexican painter. She is best known for her work showing women and experiences relating to women, and for her self portraits, often painted in naïve or primitive style. She was born in July, 1907 in Mexico City. At an early age she developed polio which meant that one of her legs was slightly longer than the other. The Mexican Revolution began on July 7th, 1910. Frida Kahlo later stated that her birth date was the same day, so that she could claim to be born on the same day as modern Mexico. In 1925, a tram collided with the bus she was on. Because of the accident, she had over 30 operations during her life and was never able to have children. In 1939, some of her paintings were exhibited in Paris. She was the first 20th century Mexican artist to have one of her paintings bought by the Louvre Museum. In 1929, she married the famous Mexican painter Diego Rivera, divorced him in 1939 and married him again in 1940. Their differences in size – Diego was over 6 ft tall and Frida was 5′ 3″ – meant that they were sometimes called the Dove and the Elephant. 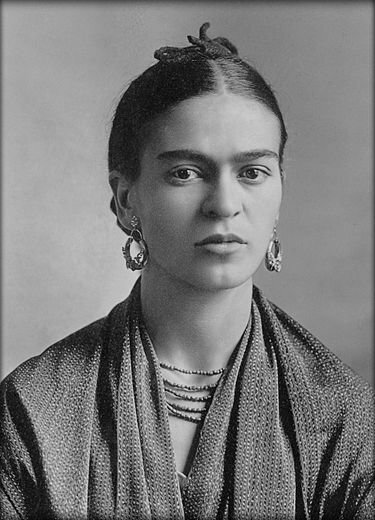 Kahlo’s work was strongly influenced by Mexican culture. Her paintings often had monkeys in them, a widely used Mexican motif, which she used to symbolize protection and tenderness. She was also influenced by primitive art, Surrealism and Christian and Jewish imagery. Almost half of her 143 paintings are self-portraits. Frida Kahlo died in 1954, although the cause of death was never fully confirmed. Her ashes are kept in an urn dating from pre-Columbian times in her former home. The house where she grew up has been a museum and popular tourist attraction since 1958. The Russian leader, Trotsky, stayed in the house in 1937 when he first visited Mexico.